Monday 19th September 2011, AUBERT & DUVAL (ERAMET Group) and UKTMP inaugurated their UKAD titanium ingot processing unit in Saint Georges de Mons in the presence of the Deputy Prime Minister of Kazakhstan and the Prefect of the Auvergne Region. Completing this 47 million euro investment will enable the partnership to become a key player on the global titanium market. 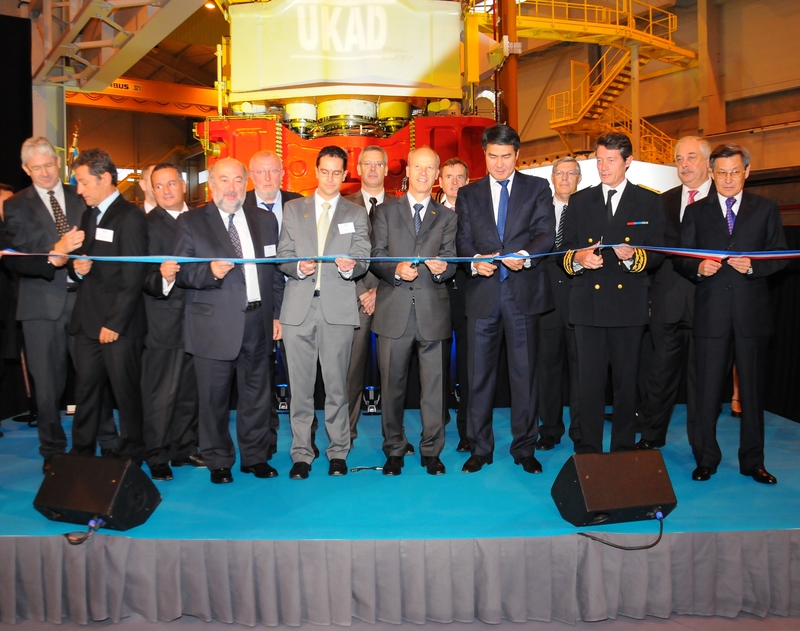 Mr Asset Issekeshev, Deputy Prime Minister of the Republic of Kazakhstan and Francis Lamy, Prefect of the Auvergne Region, officially inaugurated the new UKAD titanium processing plant in Saint Georges de Mons, before Georges Duval, Chair of AUBERT & DUVAL and Bagdat M. Shayakhmetov, Chair of UKTMP, Oliver Dreier, Director of Airbus Titanium Procurement and a number of officials and elected representatives from partner local and regional authorities also attended. UKAD will be involved in manufacturing and selling titanium products (billets, bars, wire, sheets) mainly required for the aerospace market. Construction work has just been completed on a plant for the company with a surface area of 48,000 m² (of which 7,500 m² are covered) specialising in titanium forging, finishing and inspection. Under construction since 2009, the new unit has just started production in September 2011 on schedule. This 47 million euro investment has been supported by the signing of a long term Airbus and EADS contract meaning that UKAD is guaranteed 1.2 billion dollars worth of business up to 2022. With UKTMP’s investment in the production of titanium ingots in Kazakhstan, the creation of UKAD will enable the UKTMP, UKAD and AUBERT & DUVAL group of companies to develop an integrated titanium sector and create a strong position among global market leaders. Georges Duval and Bagdat M. Shayakhmetov reasserted their desire to invest for the future in order to meet the increasing demands of their clients in the titanium sector. They both praised the high standard of the French and Kazakh teams and of their collective performance. Georges Duval highlighted the involvement and support of the local and regional authorities and of the national government for this state-of-the-art project for the Combrailles region.